Remember being a kid in the 90's? On Saturday mornings you'd pour a ridiculously big bowl of sugary cereal and sit on the floor in front of the television and zone out to cartoons. For the next couple hours you would be sucked into the crazy world of Teenage Mutant Ninja Turtles. Those turtles in a half shell were a level of cool that you could only hope to achieve. When you're ten what could be better than crime fighting turtles living in a sewer with their rat dad and eating pizza all day? Of course, the coolest but crudest of the turtles was Raphael. This turtle with 'tude had crazy strength, speed, and stealth. This guy always got his fair share of pizza. He was sure to win any squabble with his turtle siblings with his gnarly sai. Every once in a while Splinter had to get in there and set this rebel straight but usually, he was comfortable knocking heads and harassing his brothers. Now that you're older, you can achieve your dream of being as cool and crude as Raphael. 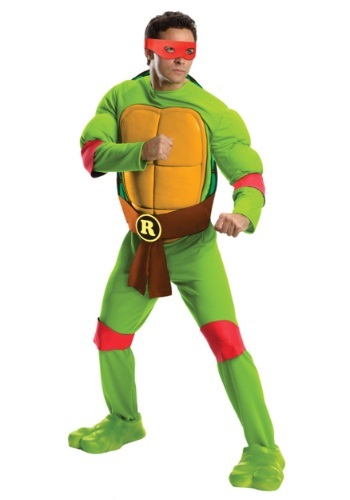 When you're dressing up as Raph, attitude is everything. Well, not everything, a rad costume is pretty important too. You take care of the attitude, we'll take care of the shell. Get your rude side ready because this turtle doesn't play nice guy. Unless he is hanging out with his pet turtle, which is pretty meta if you ask us. You'll be master of the sai when you're in your Raphael gear. Get out there and get the Foot Clan back in line. This hero in a half shell is going to earn his slice of 'za.